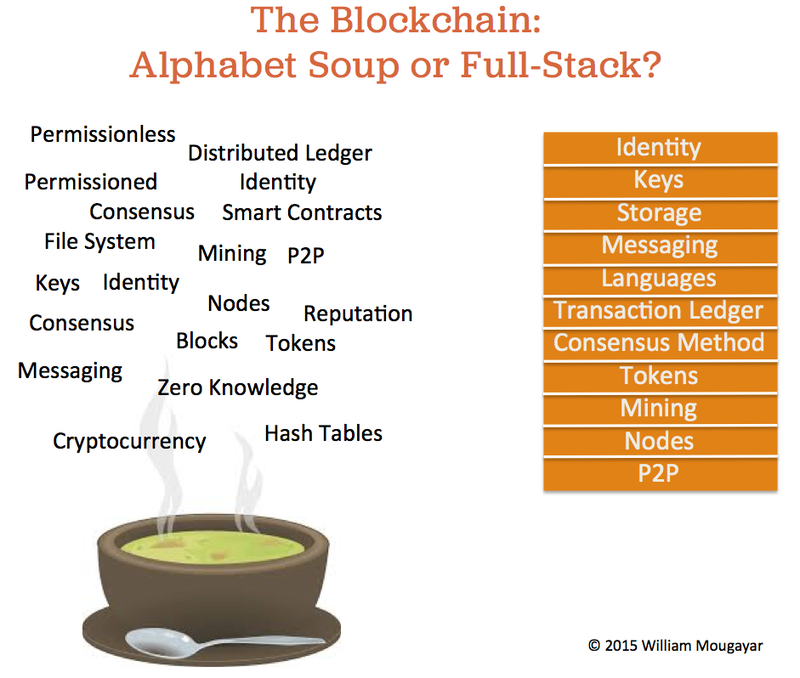 Startup Management » Is the Blockchain an Alphabet Soup or a Full-Stack? About a year ago, my friend Vitalik Buterin coined the term “Bitcoin maximalism” in an epic post, On Bitcoin Maximalism, and Currency and Platform Network Effects, and I encourage anyone to read it, or re-read it. Despite it being a year old (which is maybe 4 years equivalent after conversion from the dog years cycle that cryptocurrency innovation is living on), the article was prescient and reads as if it was written yesterday. The same issues discussed then are still front and center, today: cryptocurrency network effects, Bitcoin vs. non-Bitcoin, and Bitcoin blockchain vs. non-Bitcoin blockchains. More recently, an article by Chris DeRose of the Counterparty Foundation was titled “Private ‘Distributed Ledgers’ Miss the Point of a Blockchain”, and Erik Voorhees indirectly responded with “It’s all About the Blockchain”. Erik’s article might as well have been titled “If you don’t use Bitcoin, you Miss the Point of a Blockchain”, because it was tilting towards a Bitcoin maximalist view of the world. But let’s not digress. Finally, Fred Wilson riffed on the Economist’s blockchain-related cover page article, asking Are Bitcoin and the Blockchain Joined at the Hip?, a not-so-new debate, but one that Fred likes to engage in via the “network effects” lens, which is an argument that has some merits, but that I already covered a few months ago, in It’s Too Early to Judge Network Effects in Bitcoin and the Blockchain, in addition to Vitalik’s own coverage in the above referenced post. With that backdrop of points and counterpoints, I’m going to advocate that we should rather think of “Blockchain maximalism”. Blockchain maximalism takes a purist view and follows a Blockchain “full-stack” approach, advocating that it’s an all-or-none situation. Therefore, we could shift the discussion towards one where we try to understand more deeply the various nuances around the benefits and drawbacks of having a “full-stack” blockchain versus “non full-stack” one. As evidenced by the multiplicity of variations in the blockchain technology concept, we are seeing various degrees of implementations, and if we must accept that as a market reality, at least we need to understand what we give-up when certain pieces of the “stack” are intentionally missing. This begs the question I asked in the title: Are we at the dawn of a new alphabet soup of technologies, or a fully organized stack? And which is the better approach? The list of “compromises” is getting long: blockchain without bitcoin, bitcoin without keys, ledgers without mining, consensus without bitcoin, ledgers without tokens but with assets linked to receipts, consensus without mining, etc. Let’s take a few dives into some of these compromises, so they can be understood. The first compromise made was Bitcoin without keys. When a user logs-in to an exchange and they are only required to use a password for access, the site is actually holding their keys, not them. The password is a proxy to the keys. Loss: User-controlled security. Advanced account features. That was the second thing that newer blockchains did. They either forked Bitcoin and created a meta-protocol (e.g. Counterparty or Mastercoin), or designed comprehensive new blockchain platforms (e.g. Ethereum). Gain: More powerful programmability. Sometimes a new coin. Self-economic viability. Loss: No a priori Bitcoin network effects. Higher risk of survival without traction. Bitcoin and Ethereum are permissionless blockchains, which means that anyone can participate in the economics or operations of the network without a specific permission to do so, i.e. by just “buying” their way into it. A permissioned blockchain only authorizes a known set of users to be actors. Gain: More security (theoretically). Smaller networks, therefore easier to manage (theoretically). Mining is the mechanism what clears and validates transactions, while ensuring security against Sybil attacks. “Private blockchains” see no value in mining, therefore eliminate it in order to eliminate the potential risks it might introduce. Gain: Don’t need to worry about Sybil attacks. More security due to privacy fencing. Loss: Economic crowdsourcing of network’s operations. Openness. Inclusion. Distributed, replicated ledgers on their own aren’t a novelty, nor a disruption. The novelty arises when they are associated with a tokenization or pseudo-tokenization of sorts so that a blockchain state transition can release assets during a settlement action. Gain: No external currency fluctuations. Loss: More expensive network to maintain. The above list can probably be expanded further because entrepreneurs are creative, and they keep thinking of various permutations that could potentially exist. But if the perfect starting point is a full-stack blockchain as depicted above, how much functionality you remove is a key consideration when assessing the potential benefits one can derive from that blockchain. The more pure, the more benefits in terms of innovation, disruption and reengineering potential. The more stack layers you remove, the more you need to be realistic about the benefits expectations you will derive from a blockchain adoption. There is a case for making your own blockchain meal based on an a-la-carte alphabet soup menu, but there is also a case for gaining benefits from being closer to a full-stack adherence.